Buckeye Bullet Team Blog: It's Official, the BB2 holds an FIA Record! It's Official, the BB2 holds an FIA Record! While this record may not have been as high as our goal, it is a step closer towards achieving a high speed fuel cell vehicle, and trying to best the record set by the Buckeye Bullet 1. Now, some of you may be wondering why this record is lower than the BB2 exit speed of 224.301 MPH that was seen just a week earlier. Suffice it to say that we ran into problems with the gas delivery system, and made great steps towards fixing it, but ultimately ran the vehicle for the record at highly reduced power levels. You can find out even more about the week here. 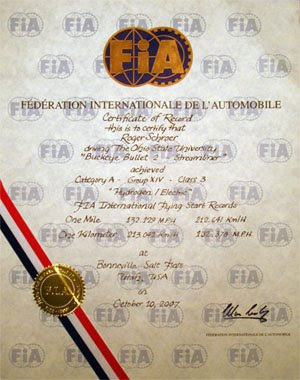 And, you can find out more about FIA speed records here.